This is my steampunk desktop (current). It shows just some of the steampunk widgets (that I was responsible for designing and programming) in operation. The operating system shown above is Windows XP Professional 32bit though you wouldn't think it to look at it. 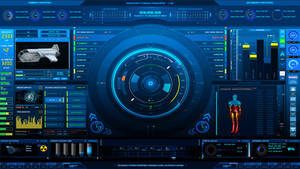 Although this screenshot is Windows, almost all of these widgets would also operate under Mac OS/X as well. 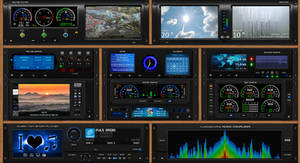 The widgets are tested under Windows XP Pro, Vista Home, Windows 7 Ultimate (64bit) and Mac OS/X 10. They will also work under windows 8. 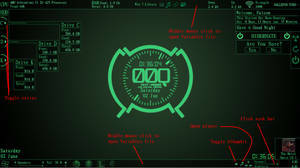 I create my own desktops with Yahoo, Rainmeter & Xwidget widgets, a steampunk wallpaper and Rocketdock as the launcher with a selection of my own icons. I don't think you can get much more steampunk than that - In fact, I challenge you to provide a more steampunk interface than mine - it must work mind, a background image is a fine thing to look at but a steampunk desktop needs to be a working thing. All the widgets shown here are desktop widgets using the old and dependable Yahoo Widget engine known previously by the steampunkish name of Konfabulator. You simply download the widget engine FIRST and install it. Then your widget downloads will simply download and install automatically. All the above are internal deviantart links, just click on them and they'll download the widget directly. The following two are external links, first to the Rocketdock site and then a direct link for the Yahoo widget engine. It is the original link direct from a Yahoo server. 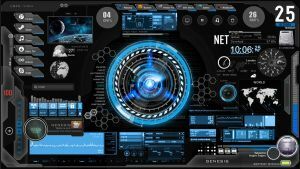 All of these widgets and icons are downloadable from Deviantart and if you choose to do so will make your desktop a steampunk visual feast. Not only a visual feast either as most are full of sounds, levers, bells and crank handles, all these little features actually work. I'm working on the resource monitor now as well as polishing off the other widgets. When done I am preparing to convert them to Xwidgets and perhaps to Rainmeter skins. We shall see how I get on with this plan. I have already partially converted the Orerry widget to these alternate engines with some help from good friends, Harry Whitfield and Mordasius. Resource usage - My system is a 2007 Acer 7720G with a 2.2ghz core2duo. It has 3gb of available memory and 1.0tb of fast hybrid hard disc. It is man enough to run all these widgets with little noticeable effect on the system. When this screenshot was taken I was also running Photoshop, Firefox, Thunderbird, skype, WinSCP and Lotus Organiser. Despite what anyone might say the widgets have very little impact on resources and as they all have a real function I am willing to accept a slight degradation in performance for what they offer. 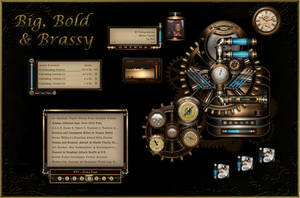 Steampunk is my 'thing' and I love creating these widgets. If you fancy providing me with any ideas for widgets then please do make suggestions, or better still commission me! I'll add links to these widgets to allow you to go direct rather than hunt around. What do you mean - for notes? Lotus Notes? Is that software you are referring to? and that's a very old desktop it has improved a lot since then. Marvelous! great designs and artistry. Hi, I already left a question on another site, but, silly me, I forgot where I put it! My teenage son and I are currently rebuilding an old Hobby 750 camper. And, as an ancient historical fiction writer I occasionally visit archaeological sites around Europe, so it makes perfect sense to me to make it look like a kind of time machine! We especially love the photographic quality of your stuff, but firstly, would you be agreeable to us downloading it for this purpose, and, would it blow up to sensible sizes without losing too much definition? Say, the size of a dinner plate? Of course - as I answered earlier, you have my permission. I'll want to see the finished item of course! 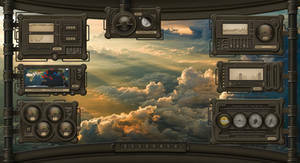 When do you think you might have a rainmeter skin for the steampunk calendar/clock which has functioning moon and earth/planets? They don't work right now. The yahoo widget engine is one such runtime but it is small. 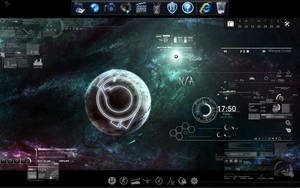 You can load it, run it and hide the dock so it does not interfere with rainmeter and still have the full function orrery on your desktop. Planets moving the lot. I love it, just love it. Thank you so much. 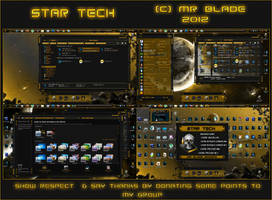 Thanks, you can recreate it with all my free widgets, icons and backgrounds. I plan on helping my father out just a bit with is computer, Its having some issues but when I think its ready for it I'm going to be using most of these thing to punk his computer out. He's into the steampunk almost as much as I am. So I'm sure he's going to love it. 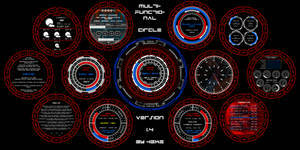 New version of the orrery on the way, enhanced functionality, new graphics. Keep an eye out for it, I will link it here. Glad you like my steampunk stuff. Thanks for the info but most of this stuff will not work with vista 32bit. Sorry old boy but you are quite wrong, I have Vista 32bit here and it all works fine, no problems whatsoever, perhaps you are doing something wrong? In any case you need to be more specific as to what the problem is and then perhaps I can help you. Sorry I wasn't able to respond sooner. Jolly good desktop you have there! This looks very original. I usually prefer technologic skins but this is very cool. No there isn't a download of downloads as each is being improved continuously, just simply follow the links to each of the widgets, don't just download, have a look and decide whether you want the widget or not, then download it. Read the instructions for each. Nope. Read the description of my desktop and it will explain what they are. I have created the orrery widget for YWE! 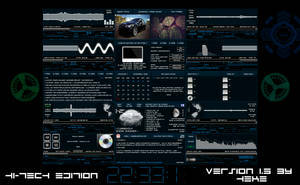 first, then for Xwidgets with Harry and then for Rainmeter with Mordasius. You found the rainmeter widget first. The other widgets are all YWE! widgets. Yes, isn't that strange, DA have changed something so that direct link doesn't work. Have corrected it now, do try again. I always answer a comment as it would be impolite not to. Great use of the Yahoo Gadgets! -Got the same ones, though! WAIT A SECOND! You designed them?! And, I'll enjoy more ones! Oh, cool! Very much of the word cool!